HUNTERSVILLE, N.C. (February 21, 2015) - Ray Black, Jr. and the No. 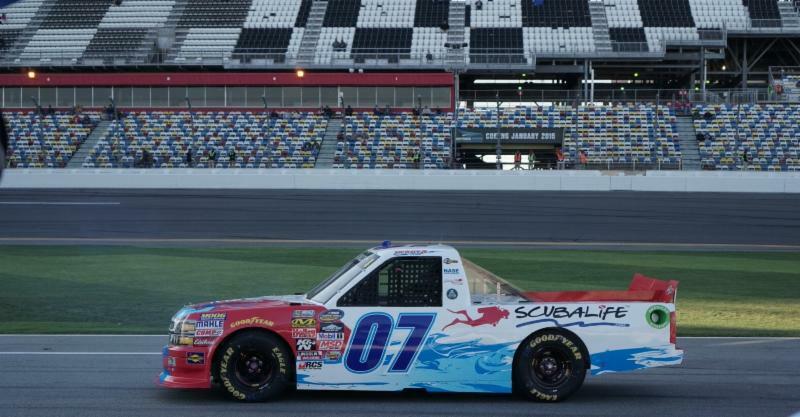 07 ScubaLife Chevrolet Silverado team finished fifth on Friday night at Daytona (Fla.) International Speedway. After rolling off in the 15th position, Black steadily improved his position throughout the night to spend the second half of the event inside the top 10. With his quick reactions assisting him in narrowly avoiding two on-track incidents, Black ultimately recorded his first top-five finish in the NASCAR Camping World Truck Series. 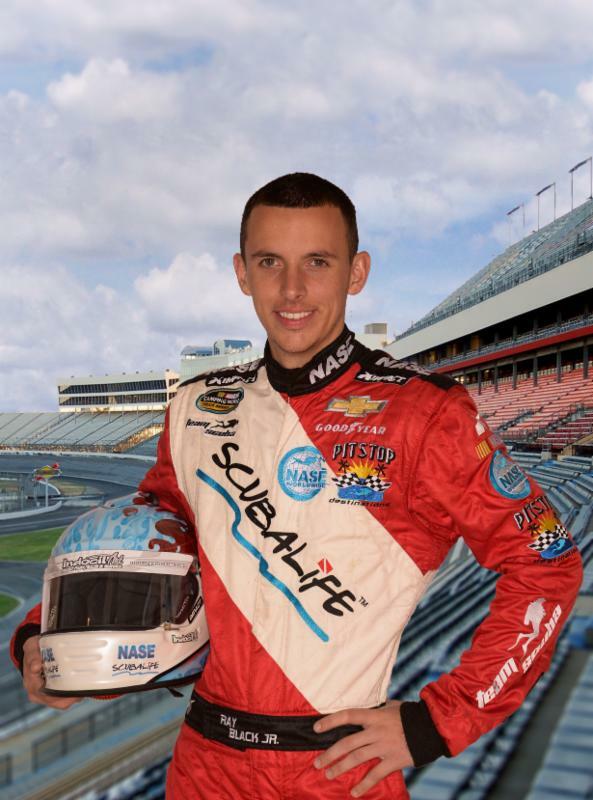 Making his superspeedway debut at the historic Daytona International Speedway, Black had an exciting race weekend in front of his friends and family, as his hometown of Flagler Beach is just 25 miles from the track. Using the two practice sessions to get comfortable in the draft, the Sunoco Rookie Contender made it through to the second round of qualifying to secure the 15th starting position for Friday's 100-lap race. When the green flag waved, Black listened intently to his spotter, and put his truck wherever he was instructed to do so. Nearing the halfway point, things got exciting for Black as an accordion-effect accident wiped out a dozen cars on the backstretch. Black, who was in the thick of the action, took evasive action as he went to the apron and back up the track to avoid the spinning trucks around him. With minor right side body damage, the ScubaLife team applied a little tape and Black was able to continue in the event. Running single file and clicking off laps, Black knew like the rest of the field that the final turn of the final lap would be his time to make a move. The rookie contender pulled to the inside groove coming off turn four to be involved in a four-wide race to the checkered flag. When the dust settled, Black was scored with a fifth-place finish in his first-ever superspeedway race. "This has been just a dream come true," Black said. "Our ScubaLife Chevrolet team built a great Silverado, and I just can't thank my team owner Bobby Dotter, crew chief Jason Miller, and team enough for all their help. I grew up just 25 miles from Daytona International Speedway, so to kick off the season here and have a great race in front of my friends and family means so much to me. We had a huge group of guests here from our sponsors ScubaLife and the CDA Technical Institute, and I'm very glad that we could put on a good show for them. I'm so excited to be running the full 2015 schedule with SS Green Light Racing--I can't wait to see what else we can accomplish this year." Next up on the NCWTS schedule is the series' return to Atlanta Motor Speedway on Saturday, February 28. The Hyundai Construction Equipment 200 airs live on FOX Sports 1 at 5:30 p.m. EST. The event can also be heard live on MRN Radio and SiriusXM NASCAR Radio. For additional news and updates, follow Ray Black, Jr., driver of the No. 07 ScubaLifeChevrolet Silverado on Facebook (@Team Scuba Racing) Twitter (@TeamScubaRacing), and Instagram (@RayBlackJr07), or visit TeamScuba.com.